Things to do in the Isle of Wight When You're Seven - Who's the Mummy? It’s been two years since our last visit to the Isle of Wight, when Flea was five. Last time, we went back to nature by staying in a yurt set in an apple orchard. It was incredibly picturesque but just a touch chilly, and a compost toilet does lose its rustic appeal after the first few visits. This Spring, we were invited to try out the West Bay Club, a holiday village on the Isle of Wight, just a minute or two’s walk from the town of Yarmouth. The West Bay Club is a village of around 100 New England style cottages set around lots of open green spaces. It’s perfect if you want a self-catering base that’s close to the action, while also offering loads of open space for children to run around safely, and make friends. I know the words holiday village can bring up visions of those places with inflatable slides and themed family restaurants and lots of enforced jollity, but I promise, that’s not what the West Bay Club is all about. This is a really relaxed spot with loads of open green spaces where children can just run around safely, and play. The accommodation is clean, modern and stylish, and there are some lovely extra touches like being able to order groceries before you arrive, and even request a meal to be prepared and waiting for you on arrival. There’s WiFi around the village and you can pay £12 a week for WiFi in your accommodation, if needed. As an added bonus, the West Bay Club has its own country club complete with its own spa, gym and impressive range of sports activities and lessons. If the weather is less than stellar, you can book in for anything from a tennis lesson with the on-site coach, or a hot yoga session (much to my embarrassment, turns out this isn’t yoga for beautiful people, but yoga involving steam, or something). There are guides who can take the family on walks and hikes, or cycle rides around the island’s many picturesque coastal pathways. You can book the kids into an activity session and enjoy a spa treatment yourself, if you prefer. Which I do. Obviously. During our visit, Flea and her best friend Zara had a tae-kwon-do lesson and tennis lessons, and made extensive use of the on-site pool, including the afternoon Wet and Wild session, with floats and inflatables. The facilities are all clean, and impeccably kept, and we found the staff really friendly and helpful. But we had glorious weather and their favourite thing to do was make use of the outdoor space, running around with water balloons and getting wet and dirty. Beyond the West Bay Club, what is there to do? Funnily enough, before our trip I asked people on Twitter for their IOW recommendations, and someone said they found the Isle of Wight boring, and would never go back. I can see where they’re coming from. I often think driving round the Isle of Wight is a bit like peeking through a window at England in the 1950s – there are picturesque villages galore, with perfect cottages fronted by neat gardens with rose bushes, and village greens, everywhere you look. There are a few “tourist attractions” but with the exception of the Seaview Wildlife Experience (which is fab) I’m not sure any of them are unmissable. But I think the reason to go to the Isle of Wight is precisely this simplicity. If you’re the kind of family that’s quite happy to spend entire days on the beach, collecting shells and crabs, and building sandcastles, then the Isle of Wight is brilliant. We loved the beaches, and the charming harbour towns, and looking for dinosaur fossils (which can be found in abundance on the Island), and the feeling of being just a little bit disconnected from the outside world (literally, since outside the main towns there is NO mobile signal to found on most of the island). West Bay Club, Isle of Wight from MAD Blog Awards on Vimeo. We loved it and the simplicity of running around in the sun with fun activities was a godsend. They’re smart enough to have lots of indoor activities so if the weather is a bit “British” they will still have fun. I would have been in the spa if i’d been more organised! I also would have ordered the Mac and Cheese had I known that they provide home-cooked family meals. I ended up on the Isle of Wight whilst in digs in Portsmouth whilst my hubby was a juggling pirate in the Spiniker tower. Bored with two children under three I decided a hovercraft trip over to the Isle was a good plan. We spent a glorious hot day on the beach. My (then) youngest sat on a blanket and ate sand whilst my eldest ran in the sea in his nappy, happy as a, well, a clam in water I suppose. This place looks great to me but I don’t have a spare £800 just now. The cottages can be costly in high season but weekends in May and June are REALLY affordable, I think. Though you should also check out our yurt review, that was awesome, too! It looks lovely, I’ve never been to the Isle of Wight. It’s really so pretty, like stepping back in time a bit. 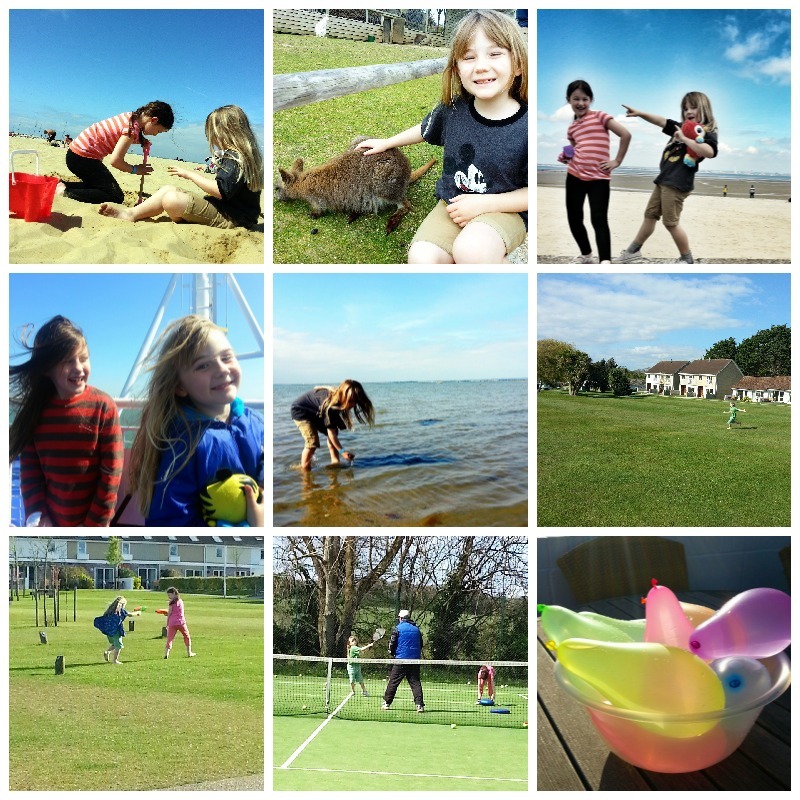 The last 2 times we went to the Isle of Wight, we stayed at the West Bay Club and the kids just love it! The pools are great and so is the home cooked fare. You are also just a few minutes drive away from the port. Smiles all round! It’s great, isn’t it? I loved the open spaces while still being close to everything. We did a day trip from Portsmouth the other year when we were in the area visiting my brother. The hovercraft ride over alone was talked about for months. We were only in Ryde, but it seemed to have a quaint shops, attractive buildings and friendly people. West Bay looks like the kind of place where it’s easy to keep a child entertained. Loads of entertainment, you really couldn’t get bored there. Sounds great! we definitely prefer simplicity for our family hols and steer well clear of tourist attractions usually. I think we may have to try out Isle of Wight with our 10 and 5 years olds. Hey Buddy!, I found this information for you: "Things to do in the Isle of Wight When You’re Seven". Here is the website link: https://www.whosthemummy.co.uk/things-to-do-in-the-isle-of-wight-when-youre-seven/. Thank you.